ExpoSolar Colombia 2019 will have a wide academic program, with national and international speakers, where we seek that the attendees to the fair build their own idea of the state of the art of photovoltaic solar energy in the region, the country and the planet. 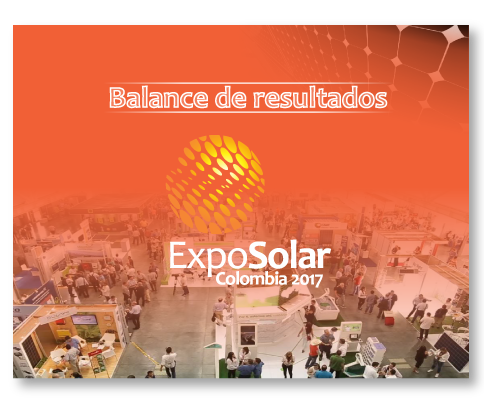 In this measure, we open the space to a group of people or companies to be linked with ExpoSolar Colombia 2019 as speakers or speakers. It can be any natural or juridical person, association, academic institution, group of specialists or investigators, who want to share with their attendees at ExpoSolar Colombia 2019 their knowledge, opinions, points of view, research or experiences about the different approaches that makes the historical advancement and development of photovoltaic solar energy and its related subjects. It is the central academic event of the fair, with which it seeks to validate from the academy, research and experience, the relevance of this theme of clean energy that today brings together all, from the industrial and commercial, as from the user and consumer; a theme that seeks to generate a critical and innovative thinking in search of behavioral changes that allow sustainable development economically viable and in harmony with the environment. It is a series of talks led by experts, academics, scientists or researchers, to discuss an important or relevant issue related to photovoltaic solar energy and its related topics, in order to disseminate it and encourage discussion or exchange of knowledge. 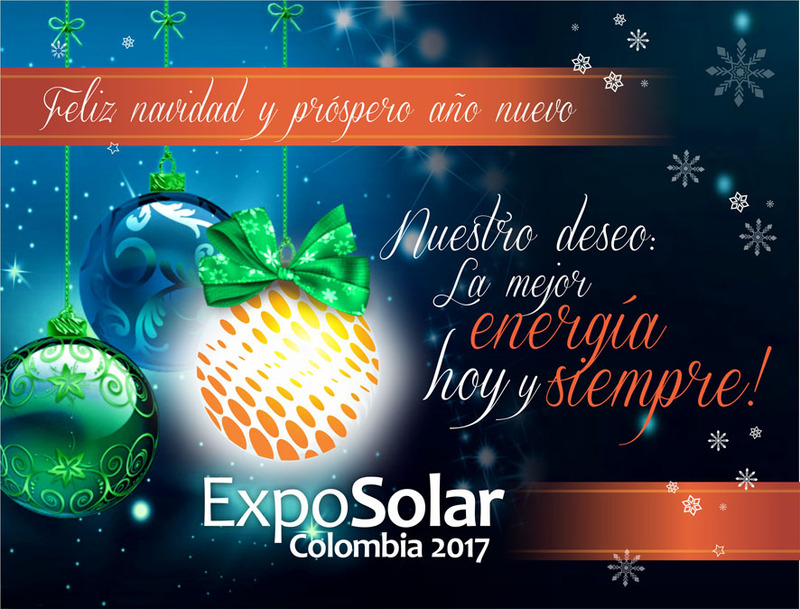 People who want to participate as lecturers can do so prior to the event in a conference circuit that will be held in different cities of the country, as a preparatory and dissemination element for ExpoSolar Colombia 2019. We hope it will be an opportunity for entrepreneurs, research groups and business developments, can publicize their developments and innovations in their localities and at the national level; We have the links of universities, environmental authorities, development groups, researchers and private companies. Likewise, some of these conferences will be held within the framework of the fair on July 11, 12 and 13 of 2019 for attendees. Workshops: (they can be theoretical or practical). It is a group of people interested in a specific topic of photovoltaic solar energy, no more than 30 people, previously selected, who meet to work cooperatively under the tutelage and guidance of a workshop to learn by doing together with others, using a reflective methodology that unites theory and practice as the driving force of the learning process. 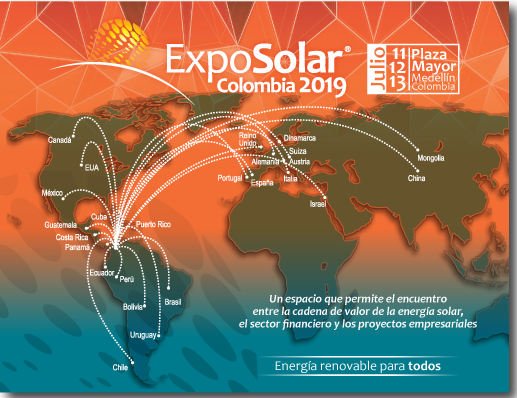 These workshops, as well as the conferences, can be given prior to ExpoSolar Colombia 2019 in any city of the country or, within the framework of the fair, on 11, 12 and 13 of 2019 for those attending it. 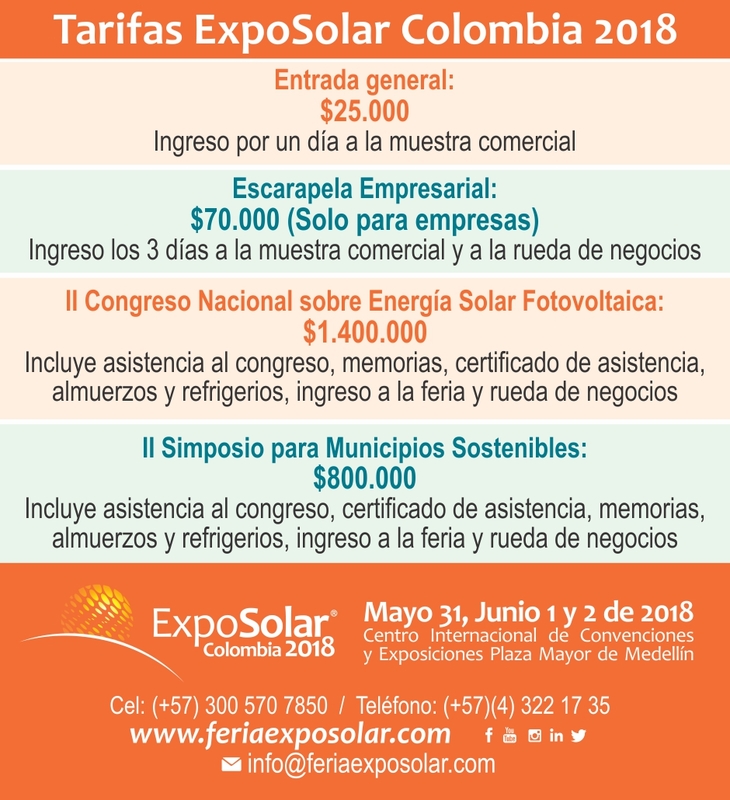 The postulates to present papers, either in the congress, symposium, conferences or workshops, can be of Colombian or foreign nationality, speak any language and must submit their application for participation to the Academic Committee of ExpoSolar Colombia 2019, by email electronic: carlos.yepes@feriaexposolar.com The academic committee will address the rules and characteristics that each paper must meet according to the type of participation, audience and audience selected.